← …Things to ..in San Blas..
What the ‘ell…is going on??! Ha ha. This is me in Honduras. This is me working on Lady Latina. Lady Latina is our new flagship cruise yacht for San Blas. I love it. I love her. Pure Honduran mahogany, rositta, and santa maria timbers ooze classic feel and comfort…..and space. 63 feet by 18 feet by an o.a. depth volume of 24 feet..pace that out! 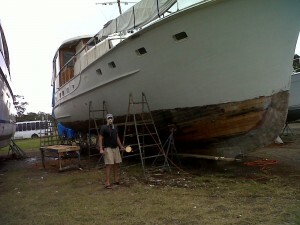 We are working round the clock and through Xmas to prepare her to bring down to Panama in January. In short we have not been able to take bookings due to arranging our larger vessels and thus not having a boat actually available in the islands. Hence the confusion. Please ‘watch this space’. Keep in contact. Trips ..new and improved…will be taking place early 2012. Of course I will be updating on whats happening as often as time permits with the physical work. I will also be putting up as much as i can on cabin layouts and so on regarding the boat. So, watch this space, or if you want to speak to me, add me on skype: philmorris3661 , or use the contact button on www.yachtLatina.com to register your interest with 0ur team down Panama City way….! All In…we are looking at a new and fabulous way of spending time in the islands of the Caribbean and South Central America! 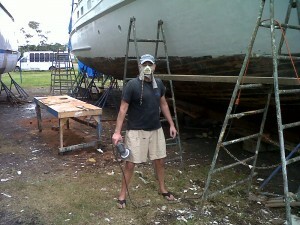 This entry was posted in Charter and Day Trips - Yachts and tagged Charter, cruise, island, Panama, sailing, San Blas. Bookmark the permalink.